This McIntyre-Sullivan Family History site is dedicated to Thomas J. McIntyre, CM (1919-2009). He is the one who started me on the genealogical pursuit many years ago. My uncle provided me with the framework for the McIntyres - taking the family back to the small townland of Lislea in County Sligo, Ireland - and "introducing" me to the Walshes of Knockahoney, County Sligo, his maternal line. I was truly fortunate to have Helen Sullivan McIntyre (1914-2008), my Mom, to share my findings with and for her to provide stories about her Sullivan and Madigan parents, uncles and aunts. We should all be so lucky. In providing information on each family member on this website, primarily events related to birth, marriage and death are included although I have additional information on many of these individuals, much of which does not appear on this public site. I have tried to document all of the findings presented. If you should find errors, please share the information with me and I will correct any misstatements. And, if you are family and are looking for yourself on this webpage, please note that I have excluded living individuals. Where more than one birth or death date has been found, the date preceded by an asterisk (*) is the date believed to be most likely. Contact me if you have questions about the content, wish to confirm information or have new information that may help to extend our families. A number of charts have been created and posted on this site. A pedigree chart is provided which shows the relationship between me and my direct ancestors as far back as I have been able to find information. Also, twelve descendancy charts have been created for the following family lines: Batke, Cawley, Colfour/Colfer, Connor, Corcoran, Ginty, Madigan, McIntyre, Reidy, Sullivan/Soraghan, Thomas/Thompson, and Walsh. Each chart identifies the most distant ancestor known. The charts exclude spousal relationships and follow the blood lines to the most recent deceased individuals. To view these charts, click on the buttons "McIntyre Pedigree Chart" and "Descendancy Charts" above and to the left. I am aware of 9 immigrant ancestors and they have been identified under the "button" of the same name. It is my intent to write the story of each of these ancestors, either as individuals or as a married couple. For now, they are identified and have links to the information provided about them on this website. Several of these immigrant ancestors qualify as Chicago Pioneers, per the Chicago Genealogy Society, i.e., they arrived in Chicago before the 1871 Great Chicago Fire. Over time, I plan to make the case of their pioneer status by showing direct linage to me. Each family has heroes who serve in the military. It is with honor that I list those ancestors whom I have discovered served our country. In researching the family history, a number of members who joined religious communities have been identified. As I learn more about these individuals, short sketches of their lives will be developed. In the process of doing genealogy, I have collected many documents, stories, photos and artifacts. In addition to this website, I have constructed a number of blog pages which provide a framework for sharing these items and the opportunity to include information that doesn't easily fit into a structured family tree. The postings within each blog are specific to the family group identified and are cross-referenced with this website. Photos, copies of documents, URL links, family stories and memories are included. Currently, there are thirteen family blog pages. The URL for the family's specific blog site is also integrated within each individual's information on this website. Search for someone you know and see if they are mentioned in a Blog. If you have some information on the family or members of the family, please use the blog forum for your comments and stories. Together, perhaps we can add a little "color" to our family! Additionally, I have created a blog which references my grammar school days along with a blog which honors colleagues at my former place of employment. Both are included in the Blog list. Just click on the Blog "button" above. It will take you to the various family and other related Blogs. In the summer of 2011 I was able to visit several ancestral farms in Ireland. Videos of the land have been posted on this website and may be viewed by clicking on the "button" above which reads "Ancestral Farms/Homes." As additional information is available, it will be added to this source. Every family has several members who lived an outstanding or even an outlandish existence. 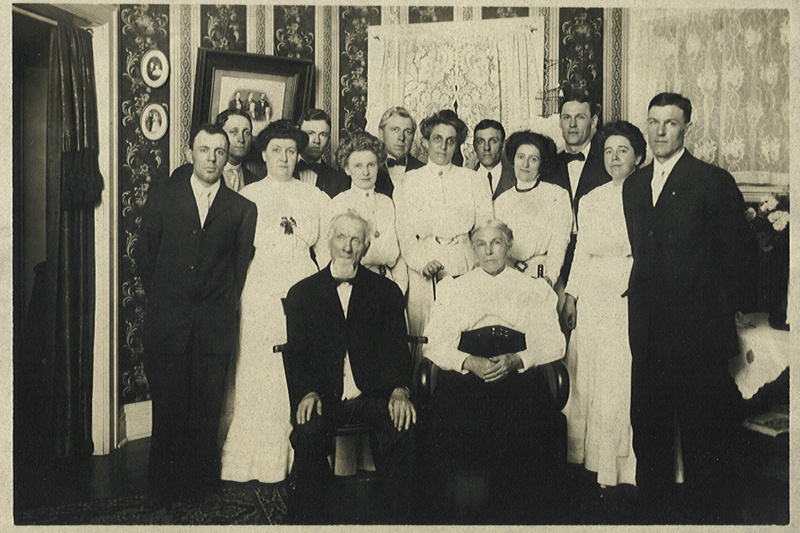 I hope to identify these individuals in my family and write up a short historical narrative of their life. These stories will be posted in this area. For now, a couple of family members are identified and their names are linked to additional information on the website. When my Mom died in 2008, I inherited her recipe box. Although Mom wasn't a "great" cook, there were a few recipes the family all enjoyed. That started me thinking about other recipes in the family, so I created a section on the website for family recipes, both past and present. Hopefully, more will be added over time. There are not a lot of family heirlooms that have passed down through the family, but there are a few. Some years back, I photographed a number of them and recorded where there were located. On this site, I have included those items that have a special meaning to me and I currently have in my possession. In addition, heirlooms held by a distant cousin have been shared and are now also posted here. I have had the good fortune to "meet" a number of cousins over the past 25 years who have advanced my family history research. With very few exceptions, the "meeting" has been via the Internet. In this section, I have the opportunity to recognize these wonderful individuals for taking the genealogical journey along with me and sharing with me knowledge of the family I would not know in any other way. I hope I too have been able to provide them with some bits of information about the family that they were unfamiliar. It is amazing how many events occur on the same day. If you wonder who in the family might have been born, married or died on today's date, check out the Ancestor Calendar tab. Or, take a look at your birthday to see if other relations had significant events on your special day. In the last few years, I have become interested in DNA testing. I have had Y-DNA tested for the McIntyre and Sullivan lines, along with my own mtDNA, which traces my female line. Of note, I have learned the McIntyres are most likely from a tribe in Ireland which existed prior to the use of surnames, and which today include Mulvihills, Kevlihans and Brennans. And, the Sullivans match McCabes more than they do Sullivans. Interesting! In July, 2010, I submitted a DNA sample for autosomal testing. This test, which is called "Family Finder" on the Family Tree DNA site, provides information on linked blocks of DNA across the 22 autosomal chromosomes which are matched between two people. The degree of matching yields evidence for the relationship between the two individuals. Since that time I have also done autosomal testing with Ancestry.com and 23&Me. Now to figure out how all these matches fit into the family! Also, a number of "cousins" have graciously taken autosomal or Y-DNA tests. The results of each continues to strenghten the veracity of found genealogical records. If you are a descendant of James Thomas and Bridget Kennedy, there is a benefactor who is willing to sponsor either a Y-DNA or autosomal test. Contact me if you are interested. In addition to continuing the family history mission, I look to the next generation, as my Uncle Tom McIntyre did 20 years ago, for the future "keeper of the stories." If you are out there, let me know! 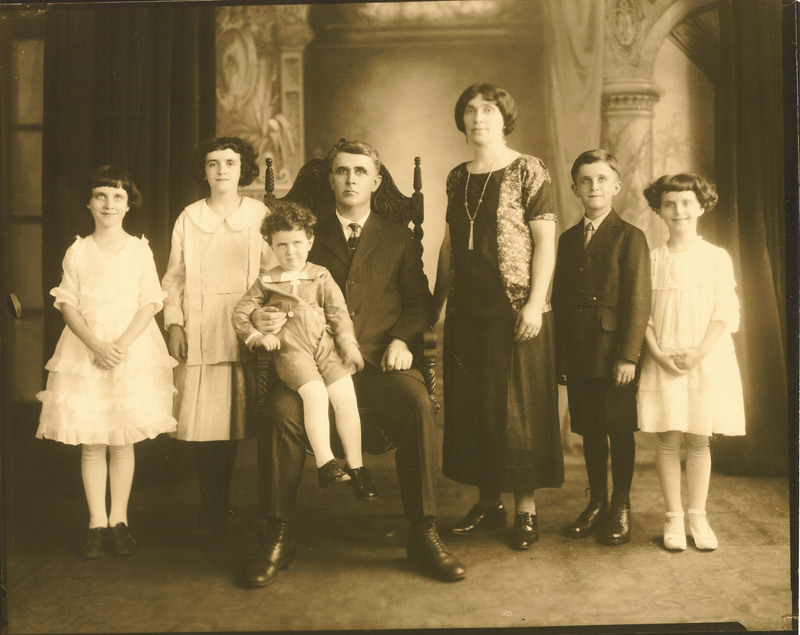 Thomas and Ellen (Walsh) McIntyre Family, c1923.